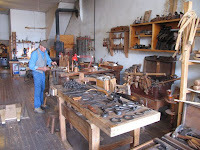 I saw the elipse machine in action last January in The woodworking in the 18th century conference. It was really something to see especially up close. It was amazing the tools and methods in their time. Bill--that wouldn't surprise me a bit! Dan, that's great news about the show. I'd like to get a closer look at that Viking chest. They look like a fun bunch of guys to be with!